Today it’s time to focus on the positive. And I am thankful! Morning Coffee – Call it an addiction or a passion. All I know is each morning the routine of taking that first sip of perfect coffee makes me smile. Baby Kicks – Baby U2 is full on movin and shakin. I love feeling him move around and I wonder what he is up to in there! Hard to believe we have less than half way to go. Good Music – Somewhere along the way, I stopped listening to music. I think it had to do with computer issues or something. At any rate, I’ve been listening again and it soothes me. Good Deals – It’s been a long time since I just wandered around the mall and did some shopping. Yesterday I did just that and it was positively therapeutic! Add to that the awesome sale at Macy’s and you have one happy girl. Family – This one should go without saying, but I just can’t believe I have such an amazing husband and son and another boy on the way. Somebody pinch me. Community -The women in my life continue to amaze me. They are full of love, peace, joy, strength, encouragement, courage, empathy, laughter, grace and beauty. I would not want to imagine my life without them. 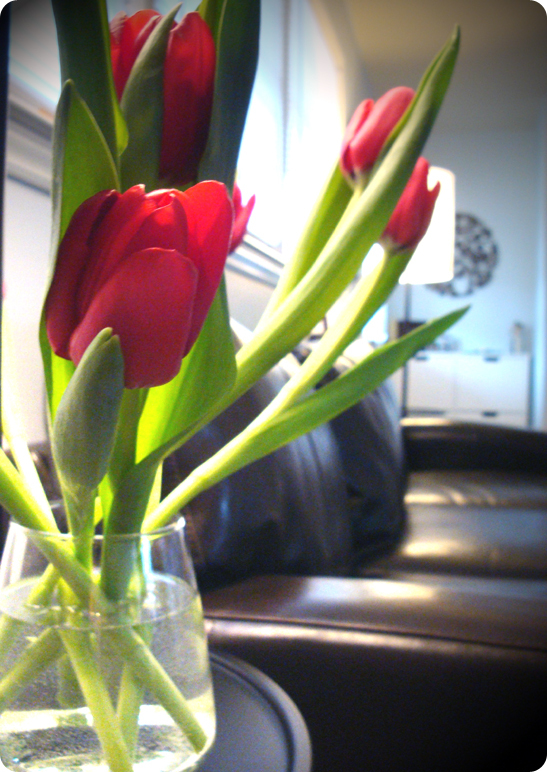 Beautiful Flowers – The tulips pictured were from my friend Molly and when I saw them this morning I just smiled from ear to ear. It was the perfect way to start a Sunday. This is beautiful, Andrea. The rainy day (and seeing my brother) made me reflective today, as well. I am thankful for my husband and boys… and taking naps with them on the couch.